At least 40, probably more, slightly larger than life figures sit inside an inflatable boat, waiting for land. Some have horns, some wear ornate collars, and some look like Nefertiti. There are a clan of mythical creatures, historical figures, and nameless men and children, that are searching for hope. Constructed by thin lengths of bamboo that wrap around them in ovals upon ovals, they are fragile as well as strong. They long for space and peace, knowing that they are barely there to the eyes of others. They are hollow and subtle energetically to the western world, yet immersed in theirs you would feel the weight and distress, and crumbling flesh. This is Ai Weiwei's "Life Cycles" at the Marciano Art Center in Los Angeles. Refuge: a condition of being safe or sheltered from pursuit, danger, or trouble. After the show, I clambered upstairs to see some hidden galleries (the place is so much bigger than it looks when you first enter). And came upon Andrea Bower's piece. I was delighted to see this piece, because a little spark tickled me, knowing that refuge is found in art, in cultivation of good things in our lives. To seek refuge, we are seeing safety and peace. Sometimes this is external, God forbid it is, and I hope our world can work on helping everyone find safe homes, decent food, and warmth. But many people also seek internal refuge, knowing that even though they are in a warm house, their hearts are longing for a closeness to… the everything. To the joy that we all can experience, but for some reason don’t know how to just “turn on”. I see this joy as something kids play so easily with. They run around, chasing each other and laughing their heads off. No cash required. Sometimes, when I need refuge, I light a candle, turn on some soft music and bring out my art supplies and tarot deck. I’ll pull a card or two and let it speak to me. Usually the cards bring forward a theme that I can then work with in a small art piece. This is why I’m so excited to share the tarot deck that I’ve been working on with all of you. I find tarot, basically, art therapy. Images can help us literally SEE what’s going on for us, where talking or reading a book may not touch the abstract place that we need to view from. 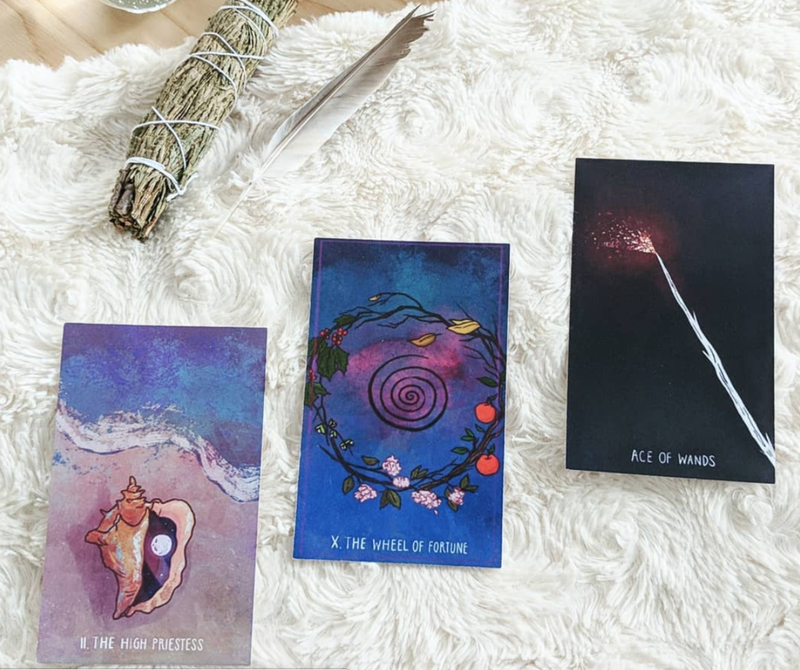 Of course, with all internal work, our power is within, but tarot can be such a lovely catalyst to accessing that power. Keep track of the tarot deck and potential release dates on instagram: @thespacioustarot ! It's a constant challenge, but that's because all practices are about balance. Our art practice is no different, but it's worth the time regardless of the frustration that ensues. In fact, I'm getting use to this idea of struggle. Life is no cruise, ok? Sometimes we get to board a pretty ship and eat the breakfast buffet, other times we have to work in the kitchen and wait tables. I think it's good for us to have healthy dose of both. Dr. Jordan Peterson- a brilliant mind- said, "Responsibility gives us purpose, and purpose gives us meaning." Ok, I'm paraphrasing this a bit, but the guts are in that notion. When I focus on the fact that my work is done in order to contribute to my peers, to children, and even support other's persuits, then I have more gumption and energy to do the work well. I am so grateful I even have the opportunity to dink around with paints and photoshop and make things! How cool is that? And when it comes to our personal art practice, we won't have ALL the time, but we have some time, and usually some time is enough time. And sharing our own ideas is such a gift to everyone around us. It's a way of sharing our story, or true selves, and it empowers others to see parts of themselves they hadn't before. Here's what I'm working on: The picture book is moving along and wowzas I am happy with where it's landing. New revised spread for “Sometimes it’s Bright”. The middle grade novel is in its final editing stages before I submit it to my agent. I am LOVING working in black and white. That is all. Concept art for “Dream Walker”. On another note, 2019 is the year I do scary things. One of those things was performing in a sketch show at Upright Citizen's Brigade, Lod Angeles, last weekend. The sketches were hilarious! Yes, I was nervous, but in the end, I did my best, and it was really about supporting the ensemble. Their skills helped me play my part, and my efforts and energy fed them. What's next? Not exactly sure, but I'm thinking a writing class?! True Belonging, and How Art will Save Us. Dr. Brené Brown does it again! I read her book recently, "Braving the Wilderness", which made me sob several times, so I had to read it again. More tears. But it is books like this that break you open, and I had can truly saw I had a paradigm shift. The Wilderness = The crazy world of emotions, vulnerabilty, the unknown. She talks a lot about major themes of the book here in this youtube video. I recommend you listen, then read her book. You will thank yourself. Basically, the juice in this interview boils down to: you WILL have to be alone in what you're doing, but find those people that can support you. Put yourself out there in front of the people who might not support you. Don't assume the worst in everyone. ...Some good things, but many gross things. Are you a freelancer? Have you experienced this? Talk to me. The wildnerness has taught me so much, but I've only stepped in halfway. There's more. In other news, here are some tarot cards I've been working on for the Spacious Tarot. They're coming along! !